To begin to take advantage of all the great deals to be had you first need to start clipping coupons. It may take a few weeks to really see the benefits as sometimes there will be a coupon that won’t be exceptionally useful for a couple weeks or so. Then there will be a great deal that matches your coupon and you be amazed at how much you will save. 3) Friends and family – most of them are probably not using their coupons from the paper and will be more than willing to help you out. 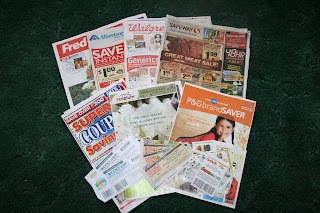 5) Buying off the internet – yes, you can actually buy coupons. Recently there was a great deal on Glade oil warmers and there were BIGO coupons so Angela and I bought a stack of them off the internet and made some money that way. It was well worth it.